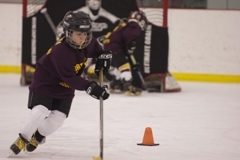 Total Hockey Minnesota also offers On-Ice Private lessons for individuals, or small groups, who would like to get some extra work on specific hockey skills in an intimate setting. These sessions allow our coaches to work 1-on-1 with the players, and really focus on the needs of the player(s). Note: Multi-player prices are for those who sign up multiple players at the same time, for the same session (up to 4 players per coach). Please call for more information (952) 469-2218 or email Pete Talafous with the link below. Team Training is an option that Total Hockey Minnesota offer's that allows our staff to run your team through a high tempo, skill-based practice. These practices are designed to recreate game like situations that occur during play. Coaches are encouraged to provide input on the practice's main focus based on the needs of the entire team. Pricing: These prices will be added to the cost off the ice, for your grand total. Coaches must be requested 48 hours prior to the practice to ensure that they are available, and to allow them to develop a proper practice plan.